This puzzle contains 300 pieces and measures 18'' x 61cm. 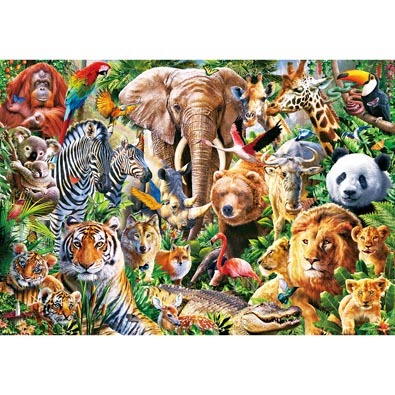 This puzzle depicts a variety of animals from the African wilderness. Available in two piece counts. Strawberry Sunrise is a 300 piece jigsaw puzzle designed by artist Jane Maday. Birds gather around strawberry plants in terra-cotta clay pots, they are ready to be planted. Brightly coloured butterflies, black eyed susans and zinnias fill the surrounding springtime scene. Available in four piece counts. There is always loads of curious fun on the farm for this little pup and kitten. An adorable jigsaw by artist Jane Maday available in both 300 large pieces and 1000 standard pieces. The 300 large piece jigsaw puzzle measure 45cm x 61cm. This 300 large piece jigsaw is designed by Julie Bauknecht and measures 18" x 24". Available in two piece count.